Plenary Indulgences As Digital Strategy? 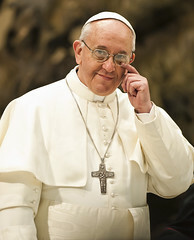 Pope Francis. Image by Catholic Church (England and Wales). I remember being young and reading Dante’s Divine Comedy for the first time. It was my first encounter with the concept of indulgences. For those not so well versed in the past practices of the Catholic Church, indulgences are acts the faithful can perform in order to reduce their time in purgatory after death. In the middle ages they were often sold by clerics for money and power, in the modern day they have been scaled back a bit. Small indulgences still exist, often for seeing the current pope speak in person. “That’s vaguely interesting, why are you writing about it here?,” you might ask. That’s simple: The pope is now offering plenary indulgences for those who follow him on Twitter and adhere to a few simple strictures. For social followers who have previously confessed their sins, have been absolved by a priest and have attended mass, they can follow along live through the social networking site and receive that special forgiveness. Users must follow the events live to participate. While not the “Catholicism WOW!” campaign from Kevin Smith’s movie Dogma, this use of social media and online communications channels by the church shows its attempt to market itself to the latest generation and to generate a greater perception of relevance to those it wishes to attract. Sounds just like any other group using social media to get its voice out there. What do you think? Indulgences for online actions? Official church social media channels? Let us know!